HST technicians are experts in OKK Spindle Repair and Rebuild. We repair to original factory performance with a full warranty. We have 30 years of experience repairing spindles. So if your OKK spindle requires rebuilding, you can trust HST to restore it to like new. And our repairs come with a like new one year warranty. Our customer sent in this OKK spindle after it was crashed. 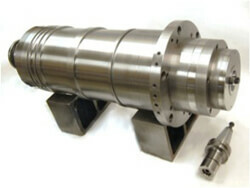 Our evaluation revealed that the spindle suffered damage to the shaft. We measured more than 20 µm run out on the taper before breakdown. It was determined that the damage was repairable using our GPG process. After our repair was completed assembled run out was 2µm. Anytime a shaft or rotating component is repaired it is possible for the mass distribution to change and this will affect the balance. Once the spindle is assembled it will still require trim balancing at high speed. OKK spindles provide a rotating balancing disc with tapped holes. High speed trim balancing is accomplished by inserting different length set screw into the appropriate position. When we repair a shaft for an OKK spindle or any other brand there are several steps to guarantee a perfect balance. The first step is to get rotating components on our Schenck dynamic balancing machine. This procedure will help us dial-in the core rotating components. Because of the high shaft rotation speeds most machine tool spindles use non-contact seals. These come in different forms and configurations and have various levels of success keeping out contamination. (click here for more info on labyrinth seals). 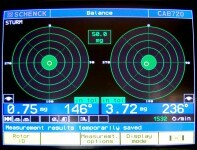 Like most high speed spindles the OKK units use a non-contact labyrinth seal. High speed machining has two opposing conditions, non-contact shaft seals, high pressure coolant inundating the work piece. Coolant fluid can ricochet off of the work piece and impinge on the labyrinth seal. After time the coolant with cutting debris and any other contaminates penetrate the seal area. Tool coolant should never be directed at the spindle shaft. Additionally we recommend leaving the spindle running for several minutes after your last cut to allow the shaft to sling off residual tool coolant. Unfortunately, each time your spindle does a tool change it stops for a few moments and allows tool coolant to “wick” into the front seal area. 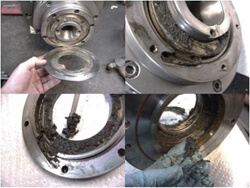 The group of four photos on the right show how severe contamination migrated past the front labyrinth seal on this OKK spindle. Once past the front cover there is nothing preventing the contamination from reaching the bearings. Of course once the contamination reaches the bearings the spindle life is shortened. And when it comes to replacing bearings in your OKK spindle, we only use top name brand ABEC 7 Super Precision spindle bearings purchased from authorized dealers. So you will only get the best. And because we only purchase from authorized distributors you never have to worry about counterfeit bearings. Only top name brand bearings are used to repair your OKK Spindle. Prior to assembly all parts are thoroughly cleaned, degreased and prepped for assembly. Spacers are ground and lapped to micron tolerances to provide the perfect preload for maximum bearing life. We replace all seals and o-rings as well as drawbar springs. After OKK spindle repair is complete it must pass exhaustive testing. Run-out, drawbar tension and vibration are some of the test that your spindle must pass before we ship it. At High Speed Technologies, Inc. we have all of the equipment and expertise required to repair you OKK spindle to like new condition. Not only will your OKK spindle look like new it will run like new. And we back up our spindle repairs with an OEM equivalent warranty. Our turnaround time is short and our pricing is very competitive. So if you have a problem give us a call; we’ll answer the phone. For more information about spindle repair please visit our FAQ or Portfolio section for information on specific questions or brands. OKK Spindle repaired to “Like New” condition. At HST we have been repairing spindles for 30 years. We are one of the oldest and most trusted names in the spindle repair business. If your OKK spindle needs repair, you can trust it with the oldest independent spindle repair shop, High Speed Technologies, Inc. Call us, we answer the phone!